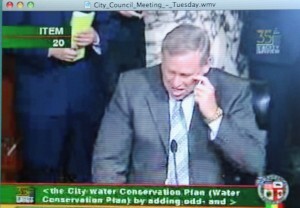 July 6: A laughing Los Angeles City Councilman Greig Smith wipes a tear from his eye as he taunts a Department of Water & Power representative over his success in flouting and, eventually, over-turning the department's hugely successful lawn watering ordinance. The Council is expected to vote in a watered-down ordinance soon. Click on the image to be taken to the city's On Demand video service. On July 6, the City Council sent the utility a neutered version of the lawn ordinance that would allow watering an extra day a week. Last week, browbeaten Department of Water and Power commissioners quietly rubber-stamped it. What is being passed off as a tweak looks more like a death knell for one of the best collective environmental efforts made by the citizens of Los Angeles. Click here to keep reading today’s op-ed in the Los Angeles Times on the gutting by City Council of LA’s hugely successful water conservation program. The July 6 meeting in which Councilman Greig Smith and Council President Eric Garcetti ambushed the Department of Water & Power’s senior water manager is available for view through the city On Demand system, but be prepared to fast forward through a cooking show for senior citizens. Or click below for a transcription of Smith and Garcetti’s performance in the pivotal July 6 Council meeting. SMITH: (Laughing so hard as he introduced James McDaniel, head of the DWP’s water system, that he wiped a tear from his eye …) “I have a question for you. We did a voluntary program two years ago, when we didn’t have anything mandatory. 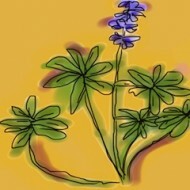 We said to people, “We need conserve.” What was (sic) the results of that? 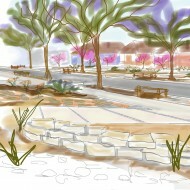 DWP/MCDANIEL: At that time, the mayor had asked for voluntary 10% conservation effort. I think we were running at 7% on a voluntary basis. 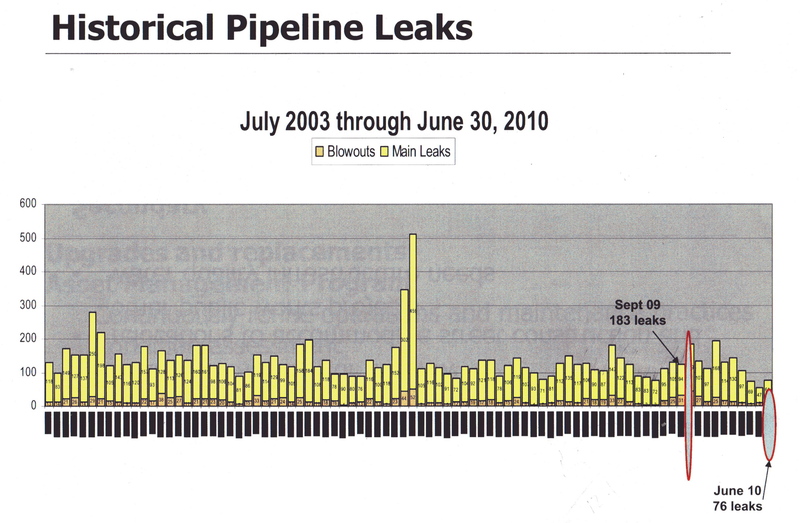 SMITH: What was the reduction of water usage over that time frame? SMITH: So You asked people of LA to cut back. They did. DWP/MCDANIEL: They did, but not as much as the goal was. SMITH: Not as much as you want. So now you come in here with a scheme… You know, I’ve never done this in seven years, I’ve got to do this for the first time. “I told you so.” We said in committee a year ago, we’d talk about the water mains breaking, I said to you, “Could that be caused by too much water going throuth the system?” You said, “No, that’s not what’s doing it.” Now you’re actually saying, that’s what did happen. Exactly what I said to you a year ago was the problem. I say to you again today, I think we need to trust our people more. We don’t need to tell them in this very complicated scheme of four different levels of what days you can water, odd even, different days, confuse the people to heck, and then we can change it to phase 2, phase 3, phase 4. Nobody’s going to know what to do, folks. Your billing system is antiquated. You can’t tell them in your billing system what you need to do. We can’t produce inserts that really anybody reads. Nobody reads those inserts. I’m sorry, we spend a lot of money, I know. People don’t read those. We publish an ordinance, and it’s posted down here in the elevator of city hall and expect people to know what to do. They can’t follow this scheme. It is too complicated for even people who know what to do and really follow it. We need to have a system that just says says: We want you to conserve. Here’s what we want you to accomplish. Figure it out. But here’s what we recommend, three days a week, 8 minutes a day rather than their proposal which is two times with 15 minutes. Your proposal is 30 minutes. Mine is 24 units. It allows people to have uses on their lawn three days a week rather than 2 days a week. Their lawns will stay green to a degree, their plants will survive, we will have a greener, better city rather than forcing something that is so complicated nobody will know what to do, everybody will be in violation because it will change time to time. Let’s just say, you pick the 3 days. We don’t care. And you water whatever time you want. We suggest the morning and the evening because we don’t want you to evaporate it, but let the people do their jobs. We can trust citizens of LA, they’re not dumb, they’re pretty smart. But when you put together a scheme like this, nobody can figure it out. So I really think, members of the council, I understand what the department’s trying to do, I support what the department’s trying to do, I may be a scofflaw Miss Hahn, but I have a water capture system at my house. We capture 360 gallons of water on my property in cisterns. I doubt if anyone sitting around here does that. So I’m committeed to this program, but it’s time, time and time that we need to trust the people of LA to do something. And let’s just give them a simplistic option and that is, Pick three days a week you want to water, water for 8 minutes, cut your water usage down, we’ll all be better off I think. It’s both the pipes and the plants. If we have plants that are dying, we certainly offset the cooling island effect we want to have throughout this city of green areas, green yards, green plants, and I think we can as Mr Smith said, certainly something that we looked at in our house as well, do smaller bursts over a longer period of time and be able to sustain that. I do think that Mr Smith is right that we do need to have some levels when we have really crisis moments and I think the department does a very good job with its water. What we’re looking at with the pipes and I think this was pointed out in the opening comments as Miss Hahn talked about or whoever it was, maybe it was in the public comment folks, could you let the folks know what is the kind of timeline for replacing the pipe infrastructure, and then I have one more comments on replacing the pipes as well. DWP/MCDANIEL: My name is Jim McDaniel, I am the senior assistant general manager in charge of the water system at DWP. Currently we have set goals for pipeline replacement in response to the rate increases that were granted to the dept in part on the justification of improving our infrastructure. Since 06/07, we went from a goal of 50,000 feet per year to over doubling that. This last year we did 110,000 feet per year. With the current staffing levels, we’ll be able to increase that, because we’re training some new people this year, we’ll be about to get that up to 130,000 feet next year and it’ll probably cap out at the current staffing level at about 155,000 feet per year. 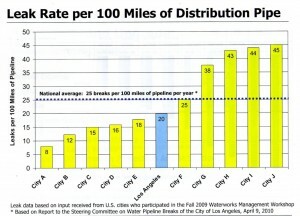 GARCETTI: And that’s a quicker rate than what’s degrading. DWP/MCDANIEL: Not really, to be honest with you. GARCETTI: So it’s degrading at a higher rate? GARCETTI: So it’s like the sidewalks here. As quickly as you’re replacing, there’s more that’s falling apart more quickly. DWP/MCDANIEL: Probably more so. We probably need to accelerate the amount of replacement. GARCETTI: And just as we looked at Proposition O, which not many people thought would pass, which was something about the water quality, I think we need to integrate our water operations more fully and maybe even look at that down the line as something the department needs to look at for its pipe infrastructure, too, as well. I also know that there are individual pipes that are burst and they’re not our mains but throughout Elysian Park, which is something I’ve brought up and this was a problem I know years ago in Richter Park years ago and it worries me because of water pressure. I go there walking in the park every single morning and there’s one guy who literally goes from place to place sticking in redwood in holes hoping that will expand, plugging it, going through little ponds of water. We have beautiful water features in Elysian Park that were never planned. I mean, we have streams and rivers and wetlands and all sorts of things but unfortunately it’s not there. So I’d likely to work closely with the department and with our department of Rec and Parks on Elysian Park. I think it’s long overdue and the amount of water we’re losing. Just to conclude, this has to happen quickly enough. I don’t know Greig if you’re going to put forward as an amendment, Mr Smith. Are you putting forward a formal amendment for three days? (Inaudible) Well I would certainly be supportive. We have dead lawns, we have burst pipes, I think we have very confused residents that are here in Los Angeles. Let’s simplify this. Let’s congratulate ourselves and the department on everybody did well, which was save water. I think May or April was the least in how many years, it was like in a decade. DWP/MCDANIEL: In the last 12 months, since mandatory conservation has started, we’ve saved about 35bn gallons of water, which is the equivalent of the amount of water that’s used on an annual basis by the cities of Long Beach, Burbank, Santa Monica and Beverly Hills combined. We’ve saved that much water. GARCETTI: That’s a great achievement. I mean people want to do right, but it doesn’t have to come at the expense of killing our plants and bursting our pipes. So let’s get it right. And Mr Smith, I think spacing that pressure out as well as keeping our plants alive is the way to do it. ABOUT those pipes. 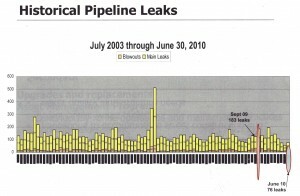 The Los Angeles Department of Water & Power has never wavered from the position that the bursts of September 2009 were symptomatic of an aging system, not the product of the two-day watering. 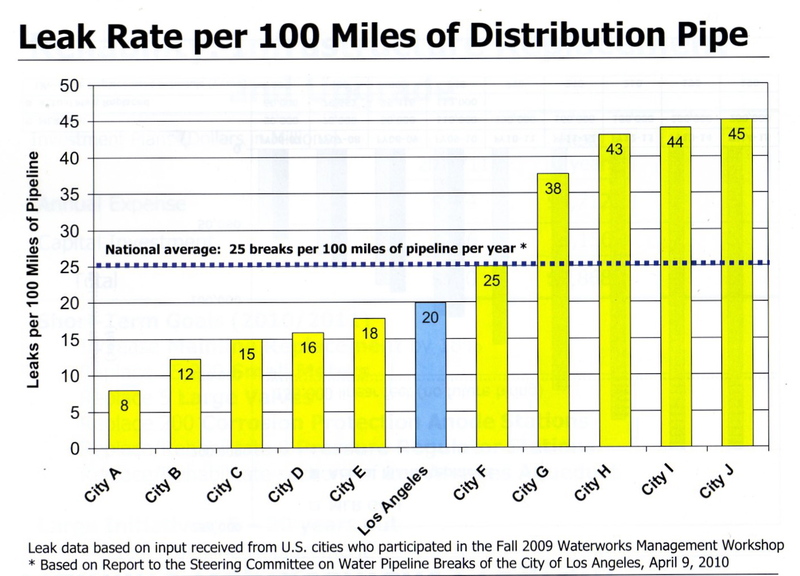 Below are two DWP graphics showing the rate of bursts month-on-month and a comparison of LA’s leak rate with those of other cities. However, an engineering group from University of Southern California disagrees. Click here for its report. DWP accepted USC’s recommendation to switch to an opposite side of the street system, hence spreading out the watering from two days to four, but on July 6, Smith and Garcetti rejected that compromise in favor of the unenforceable Smith plan. Double click on the charts to enlarge them. Meantime, how many times have I seen people here cutting already short grass, spewing smog-forming pollution into the air. Then they complain their lawn is thread-bare and dump more water on it. Excellent point, to which I would add that most homeowners here in LA pay more than $3,000 a year to mow and blow teams to do this.